I remember waking my poor father up every Sunday morning at about 6am, begging him to play a boardgame with me. I had a few favorites, some quicker than others. And I could always tell just how adorable I must have been, grinning at his bedside, when he smiled and exuded patience at the thought of having to play an early morning game of Monopoly when he could be sleeping (or at least otherwise go back to sleep in 30 or so minutes). Monopoly was great for me - I loved the little toys that you could use to designate yourself on the board. I reveled in the Community Chest and Chance cards, eagerly awaiting my "Get Out of Jail Free" card, laughing hysterically at my father whenever he landed in jail and he had to pay me $50 for my free pass out. It also meant HOURS of alone time with my father. He must have loved me quite a bit to put up with me that early in the morning on a weekend! And while, to this day, I love Monopoly, I still don't get the board. Where is Connecticut Avenue? Baltic Avenue? What is the B&O Railroad? I thought that was like the first railroad ever built in this country. Is it even still around? Why is Park Place $500?! And why, dear Parker Brothers, do I always get saddled with the light blues and never the greens? That last question aside, we can all finally know a little more about the geography of the Monopoly board. Parker Brothers is creating a world edition of Monopoly, and you have, at the time of writing this, exactly 2 days and 10 hours to cast your vote for our favorite city, Rio de Janeiro, to make it onto the board. After all these years, we'll finally understand that darned Monopoly board!!! This blog has touted the beauty and culture of Rio and, if we've done our jobs right, you're about to run right over and vote vote vote! To remind you, we've talked about the amazing Sugarloaf Mountain and the beautiful designs of the Portuguese Mosaics, the welcoming Lapa Staircase, the beauty of Ipanema, and the overall free spirit that pervades Rio, "carioca". We love Rio, and we want the world to love Rio too. That's why it's so important for us to get Rio into the eyes of the millions of people who will play this game, the children who will dream of visiting Rio (which will no doubt be at least where the yellow squares are, if not the green, on the Monopoly board), and the parents who desperately need a vacation from their annoying children who wake them up on Sunday mornings to play Monopoly, Here & Now: World Edition (sorry Dad)! We want to bring Rio into the livelihoods of America and the World, because Rio is truly an astounding city. If this hasn't sold you, well, I guess you'll have to vote for some over-traveled European city. Sigh. Vote for Rio to make it on the Monopoly board here. In 1964, the first Banana Queen Pageant – I’m not making this up – was held as part of the Banana Harvest Festival in Machala, Ecuador. I guess this makes sense when you consider that South America is one of the largest suppliers of bananas, with Brazil producing approximately 7 million metric tons annually, second only to India. Back to the pageant, it was in 1985 that the Banana Queen Pageant became an international event and was renamed World Queen of Banana, the same year that Brazil came in 2nd place. Who knew a fruit loved by so many could inspire a pageant that is still around to this day. If you’re looking for more beautiful conceptions inspired by bananas, you don’t have to go far. Brastilo has teamed up with local Brazilian artisans to produce their handcrafted Banana Leaf Hanging Lamp. 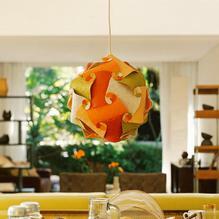 Made from genuine banana leafs, this colorful ceiling lamp adds a dramatic new dimension to any room. It's a perfect example of the many ways Brazilian artisans are using recycled or sustainable products to create spectacular works of art. Now that’s something to go bananas over; literally.